My friend Caryn and I are hosting our very first bookstgram challenge in December! We know people are busy in December, so we made the majority of the prompts 2-day prompts. You can use the prompt on either or both days, pick and choose which prompts you'd like to do, or join us for the whole month - whatever works for you! Caryn and I will be doing shout-outs every week with our favourite pictures from the hashtag. 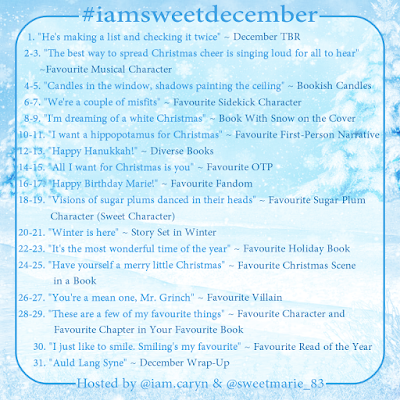 We hope you'll join us next month for #iamsweetDecember!